The fight for Kentucky's Senate seat reached new heights of acrimony on Sunday night: A debate between Democrat Jack Conway and Republican Rand Paul ended with Paul refusing to shake his opponent's hand. "I will not be associated with someone who attacks my religion," Paul said. 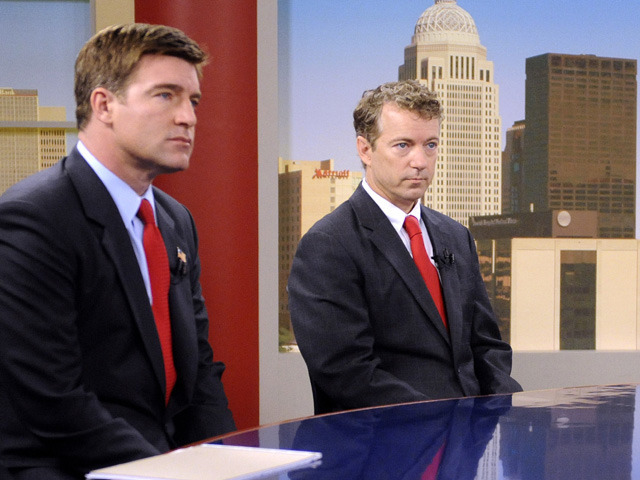 "You demean the state of Kentucky," Paul told Conway at one point during the hour-long televised debate, which was held at the University of Louisville. The acrimony - and much of the discussion at the debate - grew out of a recent Conway ad spotlighting Paul's involvement in a secret society at Baylor University that was reportedly banned for mocking Christianity. "Why was Rand Paul a member of a secret society that called the Holy Bible 'a hoax,' that was banned for mocking Christianity and Christ?" an announcer in the ad asks. The ad also brought up some of Paul's alleged collegiate hijinks with the society, called the NoZe Brotherhood, including an incident in which the student led a young woman to a creek, tied her up, and demanded she worship the "Aqua Buddha." "You should be ashamed of yourself," Paul said to Conway in his opening statement on Sunday night, referencing the ad. "You should apologize. Have you no decency? Have you no shame?" Conway, meanwhile, continued the line of attack on Paul's religious credibility. "Values matter," Conway said. "Why did [Paul] freely join a group known for mocking or making fun of people of faith? And secondly, when is it ever a good idea to tie up a woman and ask her to kneel before a false idol called Aqua Buddha?" Paul, who has denied this story, accused Conway of taking cheap shots based on misinformation he "thought" he'd heard. (The original story about Paul's involvement in the NoZe Brotherhood ran in GQ magazine last August.) "Run on the issues of the day," Paul said. "Don't make up stuff about me from college that you think you've read on the Internet blogs. Grow up." "You know how we know when you're lying?" Paul said to Conway. "Your lips are moving. You're accusing me of crimes. Do you know nothing about the process? You're going to stand there and accuse me of a crime from 30 years ago from some anonymous source? How ridiculous are you? You embarrass this race... Run a race like a man . . . instead of calling me names." The shots weren't only coming from Paul: Conway said at one point he was "always amused" to "get a lecture in constitutional law from a self-certified ophthalmologist." Current polls show Paul with a slight lead over Conway, and CBS rates the race as having a GOP edge. The two candidates also differed on health care reform, with Paul promising to "repeal the whole thing and start over" and attacking Conway, the Kentucky attorney general, for not using his power to try to overturn the law. Paul has recently released an ad in response to the Conway spot focused on his alleged lack of faith. The Paul ad, at left, condemns the Democrat for "shameless, disgraceful" attacks. "Rand Paul keeps Christ in his heart, and in the life he shares with his wife and three boys," a narrator in the ad says. "Don't be fooled by Conway's desperate attack." Even some Democrats have said they thought Conway's ad overstepped the line: Missouri Senator Claire McCaskill said in a recent interview on MSNBC that she thought the spot was "very dangerous." "Candidates who are at behind at the end reach and sometimes they overreach," McCaskill said. "This ad is a very dangerous ad because it reaches back to college... I think the ad came close to the line." McCaskill also said, however, she thought Paul mishandled the situation by refusing to shake Conway's hand. "What's interesting about this ad is how Rand Paul handled it ... he was way too thin-skinned about it," she noted.